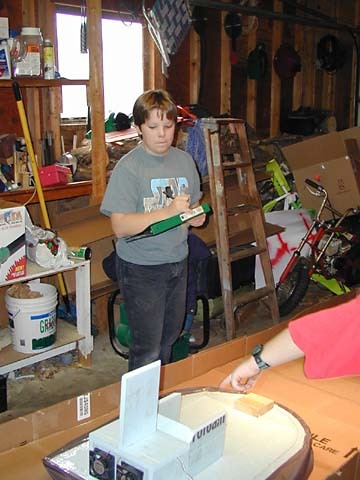 Eric chose to do a series of experiments with a hovercraft for his 6th grade science project. The purpose was to determine the relationship between a hovercraft's weight Vs. speed. 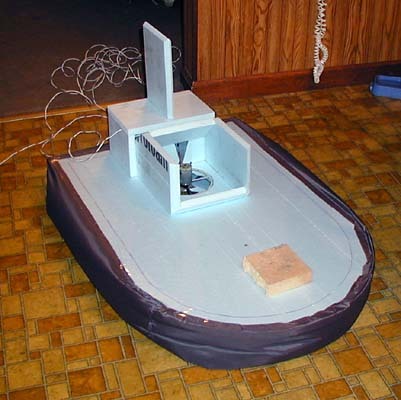 To that end, we built this 36"x24" hovercraft. We had no hovercraft experience. But it didn't look too hard. This is the top deck of the hovercraft. We used foam insulation board as the base material. We decided to make the hovercraft electric because we wanted consistent runs and to be able to run in the garage -- it's winter. The motor came from an old electric screw driver. The motor mount was sawed out of an old computer case. 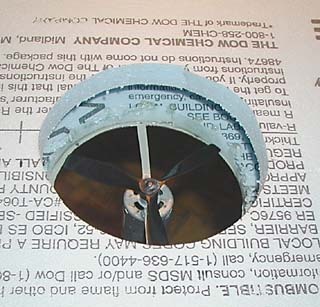 The propeller is a 6x3, 3-bladed model airplane pusher prop. This propeller is commonly used on Cox .049 engines. This is the bottom deck of the hovercraft with spacers glued to it. The bottom deck is 2" smaller than the top deck on all edges. The spacers are 1.5" high. Here are the two platforms glued together (shown upside-down). The idea here is that when the bag skirt is attached to the top and bottom platforms, some of the air will pressurize the skirt and inflate in such a way that it will descend to the ground. We probably made the spacers too high. My thinking was that we would need 1.5" to get the airflow to the skirt. But the skirt is not designed to leak air, so it does not need flow. It only needs to pressurize the bag. Had the spacers between the two decks been shorter, the bag skirt would be held in such a way that it would descend more. This picture was taken looking through the bottom of the hovercraft. 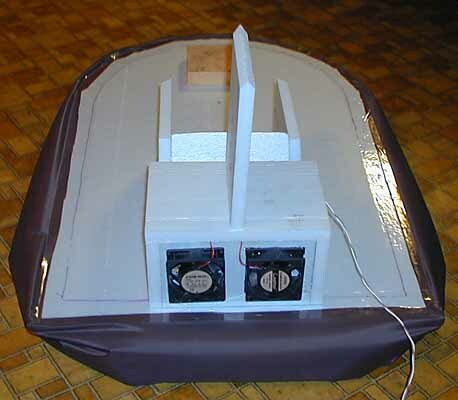 The fan pressurizes the space between the two decks and then comes out the bottom to lift the hovercraft. The two holes are the same size. We found that the bag skirt didn't fully inflate. So, we put a small restrictor on the lower hole to give the bag a little more pressure (was not installed in this photo). The box on the back houses an old computer power supply. The metal case was removed to save weight. We could have run low voltage, high current wires to the hovercraft, but these wires would be heavy and stiff. With the power supply on the craft, high voltage (120 volt AC), low current wires were used. It draws about 1.5 amps. The motor is running on 5 volts at a little over 15 amps. The brick on the bow is needed to counter balance the weight. The fans are for cooling not propulsion. For that, Eric will use a shallow ramp. The skirt is a nylon and held on by double sided tape and packing tape. I'm sure the shape of our skirt could be improved upon. 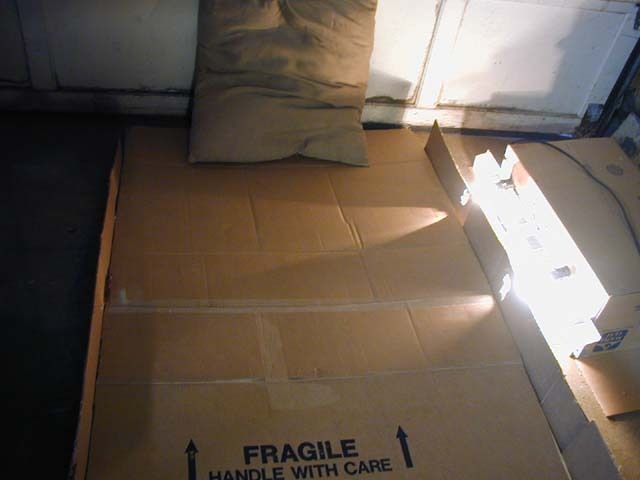 But, as shown it is near frictionless, and hovers even when carrying 10 extra pounds. As weight is added the hovercraft actually rises because the skirt starts forming a better seal with the ground. 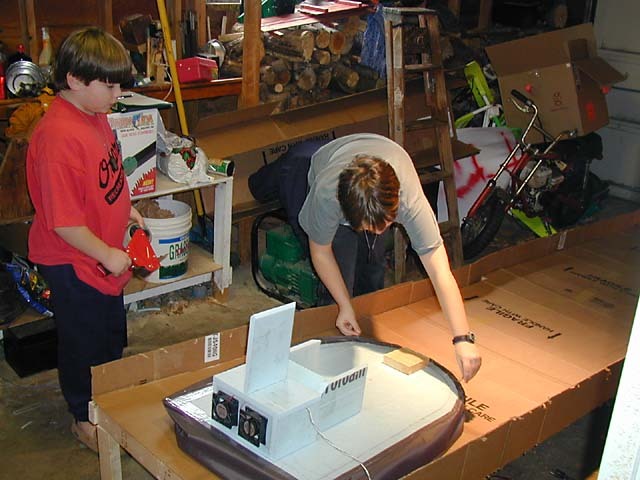 Here is the Hover craft on the 5 degree ramp that Eric and Steven built out of 2x3's and cardboard. At the end of the ramp there are two 40 watt light bulbs shining through 2 holes on the right. There are also 2 photo sensors opposite the light bulbs on the left side. They are spaced 14" appart. 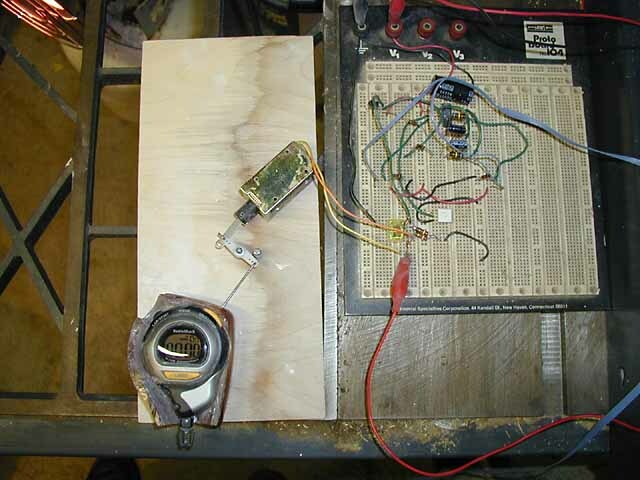 I designed and built the circuit that started and stopped the stop watch when the hovercraft passed the sensors. Eric tested the craft by adding 1 pound at a time from 1 to 16 pounds (10 runs each). What he found is that how the weight is distributed, that is, how the craft is balanced counts a lot more than how much weight there is. At 16 pounds it was slowing a little, but it was also a little slow at the light end too. It peeked at 11 pounds.